SIHH is taking place in Geneva this week, marking the first big watch show of 2018. Of course Tag Heuer is there, this year showing off its new Connected Modular 41 smartwatch, while also unveiling the Tag Heuer Connected Full Diamonds, the most expensive smartwatch ever made. The watch, made of white gold and paved with diamonds, is priced at 190'000 CHF, which converts approximately to a scream into the void - about $197,000. Tag claims it's the "most expensive" connected smartwatch in the world, and as far as we can tell it's right. It's significantly more expensive than the "regular" Modular 45 and 41, which top out at $6,750 if you want the diamond bezel. A bezel that looks like an impoverished ring of inadequacy next to the Full Diamond version. 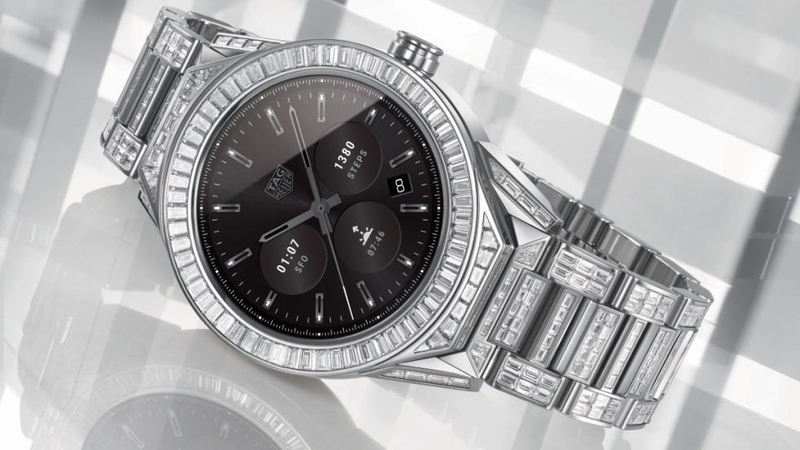 The lavish watch has the same 45mm case size as the "regular" Tag Connected Modular 45, with 18K polished white gold and 23.35 carats of baguette diamonds. However the guts remain the same, so you'll get NFC, GPS and everything else that came in the now-budget variant. Of course, the biggest problem with these ludicrously expensive smartwatches is that they're guaranteed to become obsolete in a two or three years time. Remember when Apple sold a $17,000 gold Apple Watch? Well even those watches can't support some of the latest heart rate features on newer models. On the plus side, you'll be able to swap in a mechanical movement once the electronic one becomes outdated - as you can with the other Tag models - so you'll be able to feel a bit more smug than those gold Apple Watch peasants.